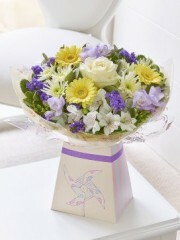 Stonehaven Florists will be delighted to provide you with a lovely choice of Purple flowers for your chosen bouquet. Flowers Stonehaven have a number of expert florists who can use their wealth of experience to produce the most beautiful purple flower bouquets. Stonehaven florists have an eye for detail and use their skills to ensure they create the best flower arrangements for you or a loved one. Love and care is placed into every arrangement Flowers Stonehaven assemble and the expert Stonehaven florists are passionate about bringing smiles to the faces of your loved ones. Each flower is of top quality and hand selected by our flowers Stonehaven team and you can be rest assured that you will be satisfied with your order. There are numerous option you can choose from in our purple flower collection to create the perfect bunch. Our excellent online website has many styles and designs you can choose from if you are unsure of what you would like to give. However, if you know exactly what you want to order or find that there was nothing on our website you were hoping for, you can contact one of the Stonehaven florist team who will be delighted to assist you in making your decision. You can let the Florists Stonehaven know which style you would like for your bunch of flowers, be it classic or contemporary, and also if there are an specific flowers you wish to include. The rest can be left to Flowers Stonehaven. With over 40 years’ experience you can be comfortable in knowing that we will ensure we arrange of bouquet of flowers to your exact taste and with the preferences of you or your loved one in mind. This service guarantees that you will be ordering a bespoke arrangement with a personal touch. 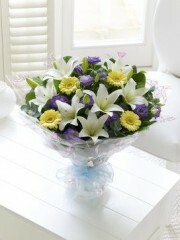 Flower Delivery Stonehaven deliver your order to an imperial standard. We offer various delivery options to you, all to insure that you or your loved one receives your hand-tied bouquet at a time best suited. Your convenience is key to Stonehaven Flower Delivery’s work and by making several times available to our customers, Flower Stonehaven can guarantee you will be happy with our service. To achieve maximum satisfaction for both you and your chosen recipient, flowers Stonehaven allows you to choose whether you wish you send your flowers before 1pm or after 1pm. This is the standard delivery service provided by Stonehaven flower delivery and is available Monday to Saturday throughout the year. Furthermore, if you wish to choose our premium service you can order a bouquet of flowers and have them delivered Same Day. Provided you have ordered your bespoke bouquet before 3pm, your recipient will be able to enjoy the fantastic delivery on the day of ordering. 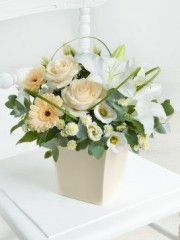 At Flowers Stonehaven we work hard to give you the very best in flower arrangement and design. We can provide you with an accompaniment of various different gifts along with your bouquet. The present Flowers Stonehaven can deliver with your flowers include luxurious champagnes, delicious chocolates, teddies and balloons amongst many others. With Stonehaven Flowers you can trust that your recipient will adore your present whether that we an expected or surprise. You can sit comfortably knowing that Stonehaven Florists take pride in their excellent service and look to facilitate you to the best of their abilities. If you have any enquiries or wish to place and order please call your Local Florist Stonehaven.